Franz Lenhart was born in Bad Haring (Austria) on January 1898. He studied Art in Vienna and Florence, to where he moved in 1921. 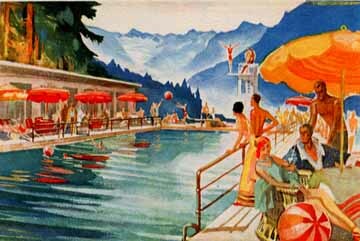 The South Tyrol (a mountainous territory south of Innsbruck) had been ceded by Austria to Italy as part of the settlement that followed the allied victory in WW I and Lenhart took a post as teacher of drawing at the Technical Institute in Merano. He obtained the Italian citizenship and is thus numbered amidst the Italian deco graphic artists, although his background and style set him apart. He was very active during the late 20s and 30s as a graphic artist designing posters, travel brochures and labels for clients in the Alps of North Italy, particularly in and around Merano, Bolzano and Cortina d'Ampezzo. In 1934 he took a job as graphical designer for navigation companies and was able to travel as far as Japan, while doing commissioned portraits, before returning to his home in the Dolomites. From about 1930 until 1955 Lenhart designed almost a hundred posters of mountain themes, of which a number depict skiers in action and are particularly prized today. After 1955 he rarely took graphic jobs, centering in artistic painting which he practiced almost until his death in 1992, at the ripe old age of 94. 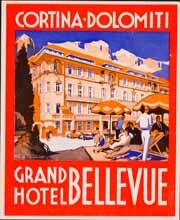 Although his poster work may be considered outstanding by some, and his graphic art (often, but not always, marked with his bold signature) is distinctive, Lenhart's treatment of labels is too often centered in the hotel building itself and never attains the grace and communicative power of Futurism artists.